An excellent ice-breaker and conversation starter with a unique way of bringing players closer together! Enjoy playing the game now! What do you do to let off steam when you're angry? What are the highlights of your life so far? Talk about a time you felt really proud. LOTS MORE CARDS IN THE BOX! Read some or all of the cards. Either by yourself or with others, pick a card and answer the questions. Explore experiences, feelings and relationships. It's great for two to six players and is enjoyed by all ages, even adults! “I love the game as it works very well as an icebreaker as well as a discussion tool. Thank you so much for talking the time to re-develop these resources. I cannot recommend them higher enough to my staff and colleagues within the community services sector. 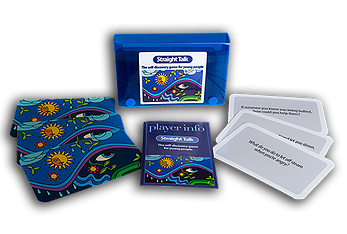 “The Straight Talk Game is great in many settings, it's an effective ice-breaker, and provokes thoughtful discussion about some of life's important and difficult topics. Thanks Diane!" "They ….. like the cards which are a great way to get them talking about important stuff." Would you like to have your own Straight Talk Card Game? Order now!